Calorex HRDs offer automatic pool environment and climate control for commercial swimming pools. In these energy conscious times, ignoring the pool water heating is no longer an option. The additional latent load of a swimming pool needs a sophisticated solution that considers more than just the air heating. “Considering the air and pool water heat losses separately is no longer good enough for modern energy concerns, an integrated approach, reducing fresh air to the minimum required, and recycling the energy lost by evaporation back into the pool water, is the way forward,” urges Barry Littlemore, technical sales engineer at Calorex. To be comfortable for swimmers, water temperatures are normally in the high twenties (°C). At this temperature the pool evaporation is substantial. To help minimise evaporation and heat losses to a manageable level, whilst giving some comfort for swimmers out of the water, the air temperature is set nominally 1-2°C above the water. 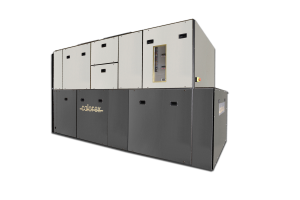 This often results in a pool hall condition around 30°C, some 10°C above that of an office, hotel or sports facility that might use a traditional air handling unit (AHU). But the higher air temperature in a swimming pool hall is not the only difference. A swimming pool is essentially a large, warm bath of water, and it will evaporate at a significant rate while uncovered. A typical 25m, six lane pool, with 325m² area, will lose an average of 65 litres of water per hour. Indeed, the majority of operational heat loss from an indoor swimming pool is as a result of this evaporation. It is important to recognise that any system must be sized for the intended operating conditions. A system sized for an air temperature 2°C above the water temperature will not cope with the extra evaporation and heat loss resulting from a reduced air temperature, leading to increased humidity, discomfort and the potential for condensation. Barry advises that what is needed for swimming pool environmental control is an AHU that will recover all the latent heat given up by the pool in normal operation and return it back to the pool, thereby minimising pool heating requirements. “Only a refrigerated heat pump system can provide efficient recovery of heat energy along with control over the potentially damaging humidity,” he advises. “By recirculating pool hall air and removing the humidity, the latent energy is automatically recovered by the heat pump and returned direct to the pool water, using a refrigerant-to-water condenser, creating a continuous cycle of energy recycling to minimise the new energy required to keep the pool heated.” Fresh air volumes recommended for fresh air dehumidification are significantly higher than those required for occupants and chemical dilution. A heat pump, with the addition of exhaust and fresh air inlet connections, needs only to introduce the much lower minimum fresh air volumes required by occupants and chemical dilution. This smaller volume also provides a boost during swimming periods to maintain the optimum conditions for bathers and spectators alike while ensuring that the humidity levels are kept low enough to safeguard the building and fabric from moisture damage. The AHU will recover sensible heat from the outgoing exhaust air and put it into the incoming fresh air. Barry continues: “Swimming pool halls should be run at a slight negative pressure to overcome the evaporating moisture vapour pressure to prevent moisture laden air being driven into the building fabric, and in the case of leisure complexes, into the attached building. This should be accommodated at all levels of fresh air induction. On units with fresh air capability it is most easily arranged by a dedicated exhaust fan in conjunction with differential fresh and exhaust air damper operation controlled automatically by the control system. “In addition, a suitably sized heat pump system also offers the option of summer cooling,” says Barry. At times where the recovered energy is not required in either the pool water or the air, excess heat can be rejected to an exhaust air condenser (in the AHU) or a remote condensing unit (located externally). A heat pump system can not only remove latent energy, but also sensible energy, offering significant net cooling to the pool hall. Lower pool hall air temperatures also affect the AHU options. Fresh air systems rely on a difference in moisture content between inside and outside in order to dehumidify, so with a lower internal temperature, there will be times of year when the fresh air has more moisture than the pool hall air, leading to a compromise in conditions in summer, and increased fresh air usage at other times. Once again, heat pump based systems are a good solution, because with energy rich swimming pool air, the efficiency of a heat pump is only slightly reduced by the lower air temperature, and less affected by the reduced effect of fresh air. Sized correctly, they will comfortably handle the increased dehumidification load, and still maintain the similarly increased pool water heat loss with heat recovery.